Have you ever felt a sharp pain in your lead hip during your golf swing? 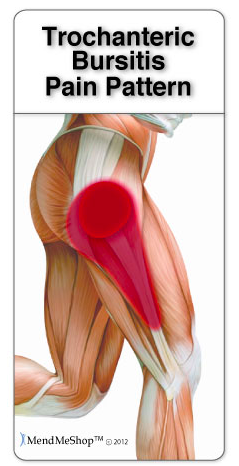 The likely culprit: hip bursitis. 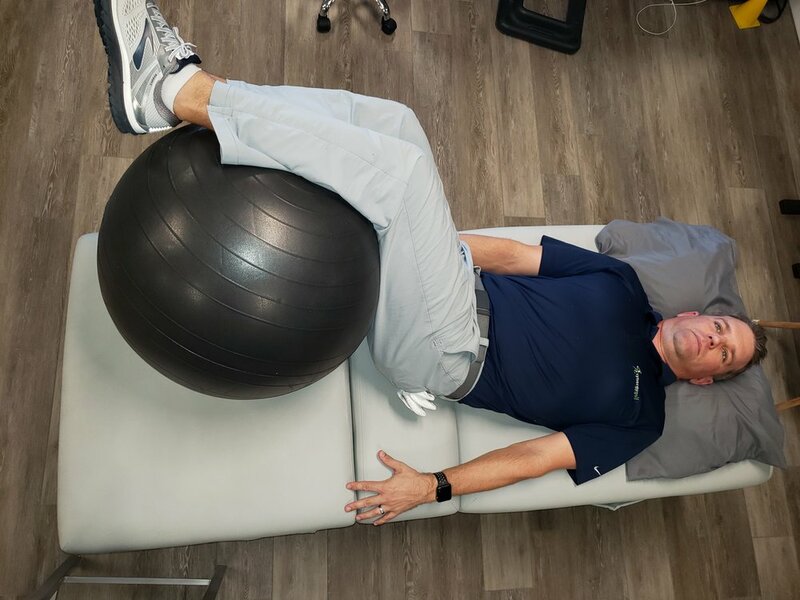 There is probably a compensation in your swing due to a lack of range of motion in your hips or spine, or both. If this is the case, the right mobility drills and the right coaching may be what you need to stop exacerbating this pain. Yes, you can get a cortisone injection which will eliminate the pain. For a bit. However, it will just keep coming back if you don’t fix the underlying issue. The human body is a master of compensation. If it is lacking the strength or the range of motion required to perform a functional task, it will look to the neighboring joints to acquire what it needs. In this case, it is a range of motion issue. The golf swing requires a large amount of rotation. Afterall, you line up parallel to the target line and end up perpendicular to the target line. So it takes roughly 90 degrees of rotation to complete a golf swing. If you have an arthritic back, your range of motion is most likely limited. However, you are not thinking about that; you are thinking that you want to hit that ball as far as possible. So where you run out of real estate in your spine, the adjacent joint picks up the slack. In this scenario, it is your hip. The lead hip must internally rotate even with a normal golf swing. 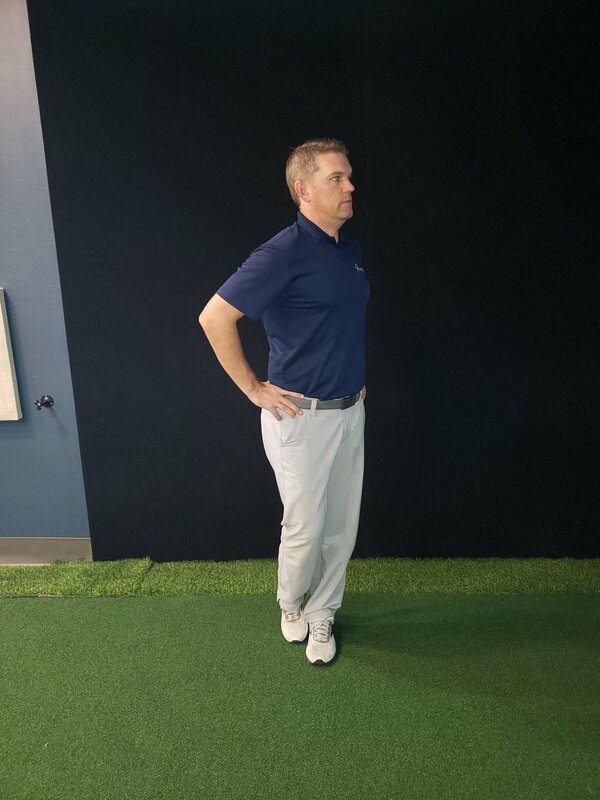 If you spine is stiff, now your body will be asking for extra internal rotation of the hip to be able to impact and follow through the swing. Internal rotation of the hip is a limited motion of the body under normal circumstances. What is it? Stand on your left leg with no bend in the knee. Now pivot to your left, that is internal rotation. While you are on the downswing, when your spine runs out of room, the hip is being asked to move in a naturally restricted motion. If you can’t achieve the necessary range, the next thing that happens is your hip slides laterally. By the way, if you have arthritis in the hip, the first thing you lose is internal rotation, just adding to this problem. Justin is leaning to his left as a compensation for lack of range of motion, pressing the femur into the bursa. So what is bursitis exactly? An ‘itis’ is latin for inflammation. So bursitis is a swollen bursa. Bursa are fluid filled sacks that act as buffers between bone and the surrounding musculature and we have them all through our bodies. They become inflamed from repetitive or chronic compression. The relevant bursitis is called greater trochanteric bursitis. The hip joint is comprised of the pelvis and the femur. The femur has a bony protuberance (the bump that sticks out in your hip) called the greater trochanter. On the surface of the greater trochanter there is a bursa, and then beyond that, there is the thick tissue of the iliotibial band (IT band). When you hip slides, your femur moves into an adducted position. The greater trochanter is now pushing the bursa into the dense and nearly immobile IT band. Let’s say you are a great golfer and regularly shoot a 70. Roughly half of those may be full swings. Factor in practice and warm ups, and you are probably ramming that bursa between a rock and a hard place 100 times a day. If you golf 3 days a week, that 300 cycles. 1200 for the month. You see where this is going. The bursa stands no chance against that kind of persistent compression. So what can be done about this? It’s a two pronged attack. You have to fix the mechanic in the swing which means you need the right coaching and feedback. You also have to fix the underlying mechanism which means improving spinal rotation and hip internal rotation. To improve spinal rotation, we are really talking about lumbar and thoracic rotation. First assess what you have. Sit in a chair (so that your hips aren’t part of this assessment), cross you arms on your chest. Are you able to pivot about 45 degrees? Less than that is not enough, so you’ll have to start some daily mobility exercises. It’s recommended to perform each exercise for about 2 minutes per day. To improve hip internal, let’s first figure out what you have. Sit on a chair high enough so your feet aren’t touching the ground. Move the left foot outward causing your femur to pivot inward. You need roughly 45 degrees of hip internal rotation. It just so happens that if you spread your index finger and middle finger apart, it forms a 45 degree angle and you can use this as a rough guide. Less than 45 degrees and you’ll need to stretch for 30 second holds. These exercises should free up the range of motion requirements. 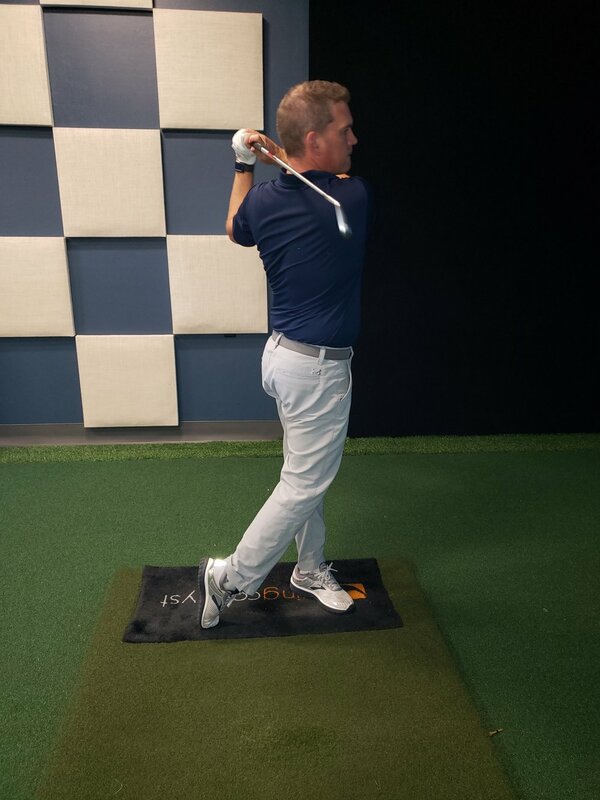 Then it will be a matter of setting up a lesson with a golf pro for the correct cuing to alter your swing mechanics and move into your new range of motions. As a general rule, with the body you want to first free up range of motion, then activate muscles in the new range to gain control of it. Stretching alone will only fix half of the problem. 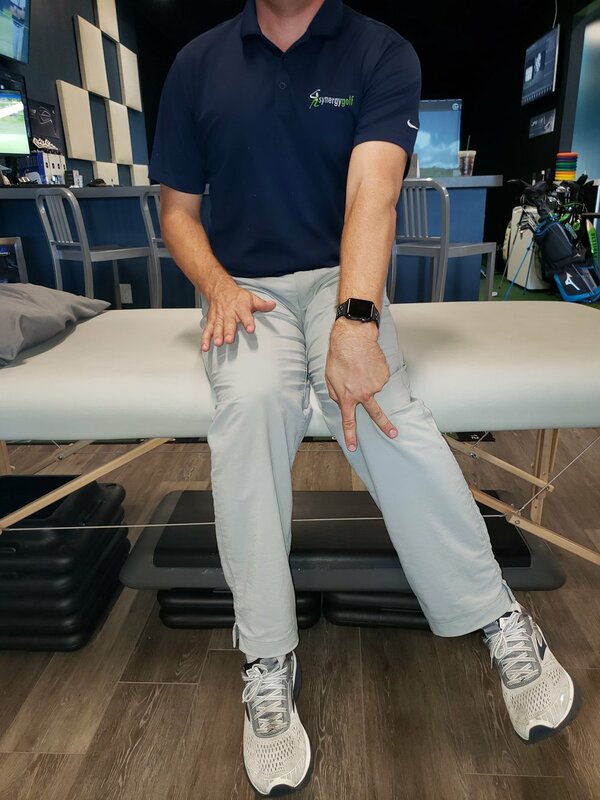 Special Thanks to Justin Ahasic, the golf pro at Synergy Health in Naples, Florida for his input.